The hilarious stories of the denizens of Bloom County (sad penguin Opus, Bill the Cat, disheveled Steve Dallas) all began thirty years ago. The comic strip written by Berkeley Breathed debuted on December 8, 1980 in a small number of newspapers. 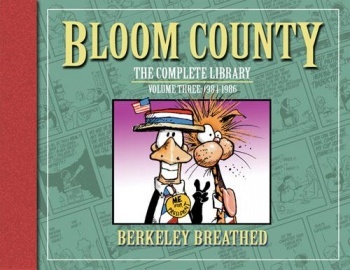 In a short time, Bloom County spread to appear in over 1200 newspapers across the United States. The strip began following the child reporter of Milo Bloom who commented on the politics of the day, which led to Doonesbury creator Garry Trudeau publicly blasting Breathed for copying his formula. 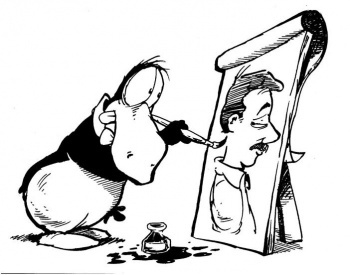 Bloom County soon found its own legs skewering pop-culture and the fragility of human emotion, even if it was mostly represented by a sad penguin. Breathed ended Bloom County inexplicably in 1989, but later penned spinoffs Outland and Opus. IDW Publishing is celebrating the debut of Bloom County by releasing four volumes of the complete collection of the series. The first three are available in stores now for 40 bucks each, but there is also an iPad version of the first volume coming this month for only $10. I'm seriously considering buying the first book for my brother for Christmas. I loved Bloom County growing up. In just three frames every day, I could laugh at humor that was at once intellectual and childish. The antics of the drug-addled Bill the Cat skewered the decade of excess that was the 80s (I still have the 45 record of Billy and the Boingers) while the nervous Opus served as ombudsman of the Bloom County Picayune. My favorite character was Steve Dallas, the shades-wearing, womanizing lawyer who always had his shirt untucked, a cigarette and a wisecrack dangling from his lips.